Is your online learning really web-compatible? Do the pedagogy, visuals and technology ensure a consistent experience across delivery media? Or, are you missing out on a cross-section of your target audience? Let’s Get Small! 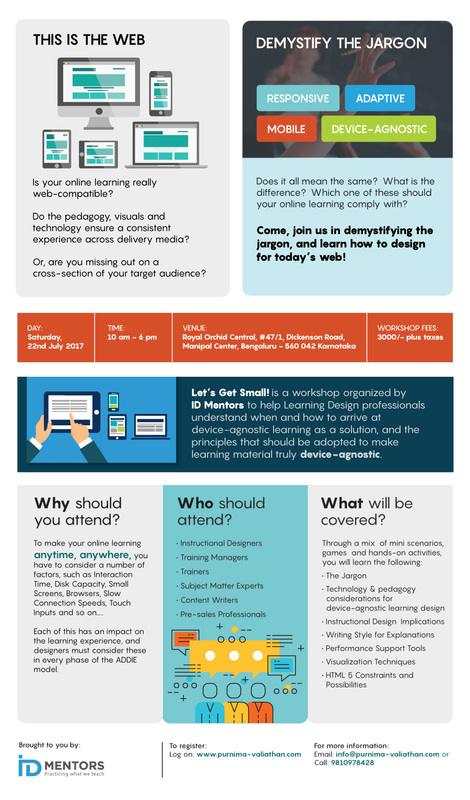 is a mobile design workshop organized by ID Mentors to help learning design professionals understand when and how to arrive at device-agnostic learning as a solution, and the principles that should be adopted to make learning material truly device-agnostic. The workshop will be held on 22nd July 2017 from 10.00 AM to 6.00 PM at Bengaluru. Register Now! Click here for registration and other details about the workshop. Download: Click here to download the brochure. The gradual transition towards a creative economy has led to a paradigm shift in the learning process. Learning systems need to be transformed everywhere; and not just in formal institutions, such as schools and colleges. From deciding what to learn, where to learn, and how to learn and be evaluated, everything is being decided by the learner. Apple, Google, Alibaba – creative economy giants that redefined how you do business. The human resources that such businesses will seek to engage with are not people who toe the line, but people who “think different”. Like bats that navigate in the dark using sensors, the current and future workforce will need to predict an unforeseen future and navigate it. To meet this unique need, continuous and lifelong-learning is indispensable. Are you a specialist – a Subject Matter Expert or a domain expert, holding valuable knowledge in your chosen field? If you are, then you have a unique advantage in current times. There are many people out there who would want to learn from your expertise; think like you do, and work like you do. But, can you wear the hat of a knowledge giver with equal ease; do you also have it in you to disseminate knowledge? Or, are you a teacher, a trainer or an instructional designer? If yes, then you are already disseminating knowledge. But, do you have it in you to disseminate knowledge in ways that appeal to Gen Y – the Millennial Generation? If you are any of the above, then Instructional Design (ID) is a skill that you need to master. It is no longer a “nice-to-have” skill; rather, it is something that will give you an edge as a knowledge giver in the creative economy. Some may argue that instructional design has its origins in the industrial age, and is not suited for the creative economy. But, we disagree. It is more than suitable. It is valuable. It is the answer to the needs of the creative economy. It all depends upon how you perceive it, and how you apply it. We are a small team of passionate people with 30+ years of combined experience in instructional design, training, technology and media. We prefer not to tread the beaten path — duck What Exists, and ask ourselves the question, What If? We strongly believe that subject matter experts, corporate trainers and teachers must make learning an effective, immersive and engaging journey for the learners – not push content down their throats, but rather, create a pull. Our endeavor is to enable every kind of knowledge giver in the society to discover the power of Instructional Design. For, when deep content knowledge synergizes with instructional design, immersive content gets created. And to prove that we walk the talk, we have created learning material with a difference. We hope that it will awe our learners (all knowledge givers), and provoke them to ask themselves, What If? Visit our portal, www.purnima-valiathan.com for details about our products and services.